As of 11:30AM EDT. Market open. Attorney General William Barr is set to speak about the Mueller report ahead of its release. Yahoo Finance's Editor-in-Chief Andy Serwer and Alexis Christoforous break down what we can expect with Compass Point Director of Policy Research, Isaac Boltansky. Major U.S. stock indexes Thursday morning saw steady trade as a highly anticipated redacted copy of Robert Mueller's investigation into possible collusion with Russia and President Donald Trump's 2016 campaign was released to the public, with lawmakers set to pore over the more than 400-page document. The Dow Jones Industrial Average was up 0.3% at 26,523, not far from a record high, while the S&P 500 index was flat at 2,899 and the Nasdaq Composite Index declined 0.2% at 7,979. A quick read of the Mueller report shows that the special counsel ultimately didn't reach a conclusion on whether Trump committed a crime, in part because of legal guidance that a sitting president cannot be indicted, the Wall Street Journal wrote. U.S. retail sales increased by the most in 1-1/2 years in March, the latest indication that economic growth picked up in the first quarter after a false start. "Retail sales really came back roaring. Ahead of the release of the report, U.S. Attorney General William Barr emphasized that Special Counsel Robert Mueller's inquiry found no collusion between President Donald Trump's 2016 campaign and Russia. 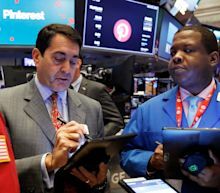 U.S. stocks were flat in volatile trading on Thursday, ahead of a long Easter weekend, as another drop in healthcare stocks blunted gains from upbeat industrial earnings and robust retail sales data. U.S. retail sales increased by the most in 1-1/2 years in March, the latest indication that economic growth picked up in the first quarter after a false start. "Retail sales really came back roaring. The stock market was sharply mixed early Thursday. Tech stocks lagged with the Nasdaq falling 0.4%. Hot IPO stock StoneCo crashed 20%. WASHINGTON (MarketWatch) - American businesses expanded in April at the slowest pace in 31 months, according to IHS Markit's survey of business executives. IHS Markit's flash PMI for services slipped to 52.9 from 55.3, while the manufacturing index was flat at 52.4. Any number over 50 signifies expansion. "The U.S. economy started the second quarter with its weakest expansion since mid-2016 as businesses reported a marked slowing in output, new orders and hiring," said Chris Williamson, chief business economist at IHS Markit. Other economic indicators, however, show a somewhat stronger U.S. economy. Stock-index futures were a little lower as more earnings reports poured in and investors waited for the release of the Mueller report this morning. Also in focus is Pinterest’s initial public offering. Reports of a potential acquisition by the marijuana company lifted Canopy, while Alcoa, Las Vegas Sands, Snap, and United Rentals were in focus as well. Stock markets were subdued Thursday as investors digested corporate earnings reports and mixed economic data, with some traders in Europe preparing for a long weekend. London's FTSE 100 fell 0.1% to 7,460 and Frankfurt's DAX rose 0.5% to 12,208. A survey of manufacturing activity in Europe showed the sector stabilized in April after months of declines. STOCKSTOWATCHTODAY BLOG 7:31 a.m. The Dow Jones Industrial Average looks set for a lower open Thursday as the market awaits the release of the Mueller report. Dow futures have declined 34 points, or 0. MARKET EXTRA Major U.S. exchanges will be closed on Good Friday, while the most-watched European markets will be closed on both Good Friday and Easter Monday. Good Friday is a Christian holiday that commemorates the crucifixion of Jesus Christ, while Easter Monday is the Monday following Easter Sunday, which celebrates Christ’s resurrection. You don’t have to look hard for reasons why stocks are nearing new highs—and most of them can be found in the wreckage of the December selloff. Major Asia-Pacific markets closed lower. On the trade front, sources told CNBC on Wednesday that Beijing officials are looking at U.S. President Donald Trump's upcoming international travel dates that might offer potential for a summit off of American soil. Major Asia-Pacific markets closed lower on Thursday, with Indonesia's benchmark index bucking the overall trend as stocks jumped on election hopes. JPMorgan Chase & Co.'s CFO Marianne Lake is scheduled to step down as the bank's top financial officer after about seven years in the role, effective May 1, the bank said in an internal memo Wednesday afternoon. She will become head of all of the company's consumer-lending operations. The 49-year-old executive will be replaced as CFO by Jennifer Piepszak, JPMorgan's current CEO of card services. Lake was appointed CFO and member of the bank's operating committee back in 2012, and has been viewed by industry watchers (and still is) as a possible successor to CEO Jamie Dimon, when he steps down. Dimon said of the planned change: "We're extremely fortunate that she will be heading a major group of businesses that is core to how we serve millions of Chase customers." Lake will remain a member of the bank's operating committee and become CEO of consumer lending, which will include the bank's credit card, home and auto loan businesses. Meanwhile, Piepszak, 49, is a more than 20-year veteran at JPMorgan Chase. Shares of JPMorgan, the nation's largest bank by market cap, finished Wednesday's session up 2.8% and have gained 17.1% so far this year, with that rise aided by better-than-expected results from the bank last week. JPMorgan's stock performance has thus far outperformed the broad-market S&P 500 index , which is up 15.7% year to date, and the Dow Jones Industrial Average, where it is a component, which has returned 13.4% over the same period. Corrections and amplifications: Fixes the ages of both Piepszak and Lake, which was incorrectly stated in an earlier version. Both executives are 49 years old.